Over the next few months, your organization will be sending numerous appeals, posts, emails, and messages into the world. It is vital that what you send your supporters reflects your mission and brand. 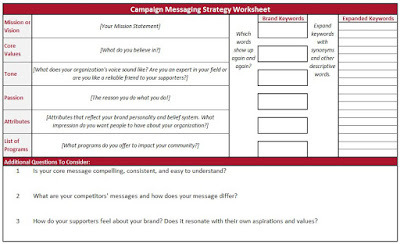 The one simple tip in this blog post: check your campaign message before publishing. To successfully execute consistent brand messaging, you will need to have a clear idea of what your brand is. This includes logo specifications, colors, tagline, fonts, slogans, mission statement, etc. It also includes your voice, target audience, how you tell stories, the kind of pictures you use, your programs, motivation for making a difference, and more. Your brand is how the outside world perceives your organization.